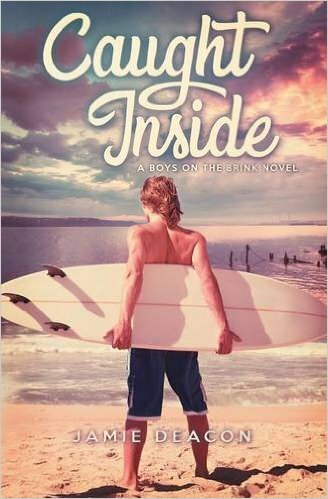 Wendy reviews Caught Inside (Boys on the Brink #1) by Jamie Deacon. Published by Beaten Track Publishing September 29, 2016, 320 pages. Luke believes he has his life figured out…and then he meets Theo. It should have been simple-a summer spent with his girlfriend Zara at her family’s holiday cottage in Cornwall. Seventeen-year-old Luke Savage jumps at the chance, envisioning endless hours of sunbathing on the private beach and riding the waves on his beloved surfboard. He isn’t interested in love. Though his rugged good looks and lazy charm mean he can have his pick of girls, he has no intention of falling for anyone. Nothing prepares Luke for his reaction to Theo, the sensitive Oxford undergraduate who is Zara’s cousin and closest friend. All at once, he is plunged along a path of desire and discovery that has him questioning everything he thought he knew about himself. No one, especially Zara, must find out; what he and Theo have is too new, too fragile. But as the deceit spirals beyond their control, people are bound to get hurt, Luke most of all. We were given a complimentary copy of this book in exchange for an honest review. I was given a chance to read a new to me author with his debut novel. An experience that I don’t get every day. I am so pleased to be able to read this book and write a review. First I want to say that I have rarely read a debut novel that is so well written. Jamie Deacon writes like a seasoned author, I would have never guessed he was a newbie if I hadn’t been told. The characters are so true to life that I was instantly catapulted back in time into my late teens. It felt just like real life when I was reading these young peoples story. Strike me very impressed! Luke is simply one of my all time favorite characters! He made me want to hug him and protect him from everything on one hand and then hug him because I was proud of him with the other. I love how his character is (like the title says) on the brink. I think it covers more than one thing for Luke. It felt like he was on the brink of discovering and accepting who he really was as well as being on the brink of adulthood. He was at that stage where he was seeing things with an adults eyes, but was still young enough to have that teen angst that muddles everything up. I admired his character though for being the one in the relationship with Theo who wanted to get it all out in the open, even if he didn’t look at the whole picture and what exactly that would mean for him. He was as true to himself as he could be. Theo is one of my favorite tropes… the broken man. He may have been the oldest in this group of characters, but he also had a big helping of angst that was evident in almost everything he did and said. He struggled with family issues like the loss of his mother and having recently “come out” to his father which didn’t go very well, to his breakup with a boyfriend that he was very much in love with. He comes from a family with LOTS of money and that is very well depicted in his character as well as his friends who come for an unexpected visit. The chemistry between Luke and Theo is sizzling! The kisses they share as well as the touches and looks that Jamie writes about are written so well that I swear I could feel them myself. There is drama in everything these young people do which is true to the age they are even if it is somewhat aggravating at times (maybe because I don’t want to remember myself as that self absorbed ha ha). And the secondary characters are just as brilliantly written as the MC’s. Watch this author closely, he’s wonderful and I can see him really going places! I will certainly be reading everything he writes just as fast as I can get my hands on it!